Chia seeds are a nutrient dense superfood with medicinal values. It is mildly nutty in taste and a versatile ingredient in recipes. It is a gluten free whole grain food. 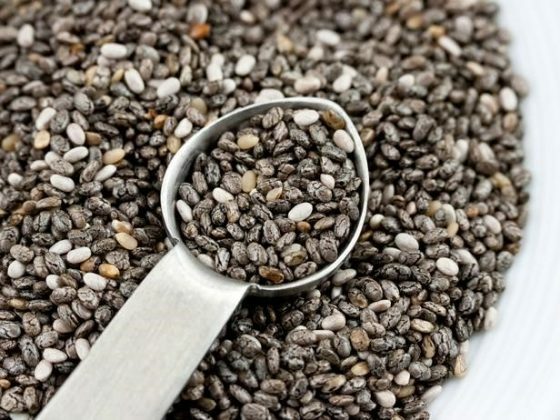 Besides this Chia seeds also contains vitamins A, D, E, B1, B2 niacin, antioxidants, zinc, iodine, iron, potassium, and copper and omega-3 fatty acids. Consume Chia seeds for healthy brain and body. Aids digestion– One serving of Chia seeds is enough to provide the recommended fiber intake of a day. Fiber promotes the bowel movement. Soluble fibers present in Chia seeds produce gelatin that supports the growth of gut probiotics. Consume Chia seeds to reduce weight– Being rich in fiber Chia seeds absorbs a considerable amount of water and gives a feeling of fullness. This subsides hunger and prevents us from eating more. It is low in calories and dense in nutrients. Proteins present in it is high in quality and quantity. High intake of protein reduces cravings and appetite. It enhances metabolism and burns belly fat. Slows aging– Being rich in antioxidants Chia seeds fights against free radicals and prevents oxidative damage. Antioxidants repair the skin, slows aging and prevents diseases like cancer. Prevent diabetes- It contains Alpha-linoleic acid and fibers. Consume Chia seeds to prevent dyslipidemia and insulin resistance. Maintains heart health- Chia seeds contain omega-3 fatty acid. It lowers that bad cholesterol and triglycerides, increases good cholesterol and prevents inflammation. It also lowers the blood pressure, reverses the oxidative stress and reduces the risk of atherosclerosis. Consume Chia seeds to Strengthen bones- Chia seeds are rich in calcium, which is essential to maintain bone mass and health. It contains boron that promotes the metabolism of calcium, phosphorous, magnesium and manganese. All these nutrients are required to maintain bone health. The egg replacer– Egg is rich in cholesterol, but we use it baked products. If you mix 2 teaspoon Chia seeds with 3 tablespoons water. It forms a gel. This nutrient-dense Chia seeds can be used as an egg replacement and it is cholesterol free. Consume Chia seeds for dental health– Chia seed is rich in calcium, which is the building block of teeth. It contains zinc that prevents mineralization of the plaque on teeth and also prevents bad breath. Chia seeds also contain phosphorous and vitamin A that is required for healthy teeth. 20 grams Chia seed 2 times a day is recommended. Do not consume Chia seeds more than this or it may hamper your digestive system. Soaking Chia seeds for 30 minutes to an hour releases enzyme inhibitors thus soak or grind them before adding to any recipe to access most of its nutrients.